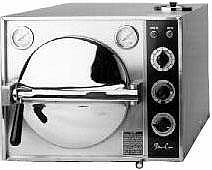 Also functions as a dry heat sterilizer (up to 175C). Cold start: Reaches 120C in 10 minutes. Warm start: 120C in 4 minutes.